Insert a non accepted simcard, and enter code when prompted for a code or when phone asks for a "Sim Network Unlock Pin"
NOTE : This is the only factory unlock solution for Apple iPhone as the IMEI is registered as “Unlocked” in Apple database. Your phone will always be unlocked even after each new iOS update! * Your iPhone has to have been activated and used on the Carrier / Network you are trying to Unlock. * If your iPhone is Barred / Blacklisted by the Network please contact us first. Only some iPhones can be unlocked which are Barred / Blacklisted. 5. By inserting new SIM card, connect your iPhone to your computer and wait for iTunes to detect your phone. 6. Once it's been detected, disconnect the iPhone from your computer and wait for 20 seconds or so. 7. Reconnect your iPhone to your computer and wait for iTunes to detect it again. 8. Once your iPhone is detected for 2nd time, the process is completed and your iPhone will be unlocked. After searching for few seconds, you'll see your new carrier logo appear in the top left hand corner on the screen of your iPhone's. This unlock is permanent and you can update your iPhone's firmware at anytime. 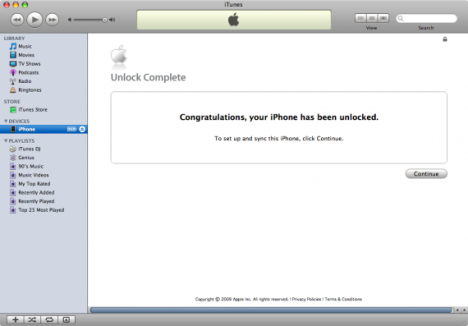 If you wish to see the unlock screen below within iTunes to confirm this is an official unlock, simply perform a restore within iTunes and once your iPhone is restored you will be presented with the message"Congratulation's, your iPhone has been unlocked" once the restore has completed. If you get "Network Unlock Unsuccessful" message, don’t worry. This is a very common problem and there are different ways to solve it. Just make sure your phone is asking for the unlock code. 9. Your phone is now permanently unlocked! 1. Power off and on your phone with non-accepted sim card. Wait until the phone asks for the unlock code. You will see the message "SIM network unlock PIN" or "Enter Network Lock Control Key"
2. Here enter the unfreeze code we sent you in the email with the unlock code. Hit Unlock button. You will get "unsuccessful message" again but don't worry. 3. Now type the unlock code and click the Unlock button. 4. If you get "unsuccessful unlock" again then hit Dismiss button and type *2767*3855# on phone keypad. (CAUTION! This will delete all your data! if you want to prevent data loss, make a back up). 5. When the phone is done restarting, wait until it asks for the unlock code again. 7. Now type the unlock code and hit Unlock button. You must get the message "Successful unlock". 1. Turn off the Wi-Fi on your phone and then turn your device ON without SIM card. 2. Go to phone dial screen and DIAL: *7465625*638*# it will bring you to the NETWORK LOCK screen. 2. Make sure iTunes is updated to the current version. 3. Make sure the phone is not jailbroken. You will have the remove the jailbreak (lower baseband). You can Youtube how to do this. 4. Also try doing this process again on another computer. Sometimes this helps the issue too. Also try turning on/off the Airplane Mode, remove/insert SIM, plug/unplug from computer, connect/disconnect iTunes. 5. If the phone is reported STOLEN/LOST it will not work on USA GSM. It will ONLY work outside the US. 6. If the phone is NOT ACTIVATED, it will not work. You will need to activate it by using an active AT&T USA sim card through iTunes. 8. If your phone is not unlocking or getting signal, you can perform the backup/restore once again. It might take up to 3 times to get it provisioned and unlocked. You can also try to restore on another computer. My phone says it’s NOT ACTIVATED? You need to use an AT&T active sim card (or a sim card from the original carrier) to activate or get the last owner billing zip code & last 4 of social. Please DON’T confuse UNLOCKING with Activating it. They are not the same thing. Try reconnecting to iTunes, perform a back-upand then restore your phone. Phone is Jailbroken and will not allow me to do a restore. Open iTunes and connect the iPhone to your computer. If you have important information on your iPhone, create a Back Up by clicking on the “Back-up now” button. Then proceed to step 3. After exactly 10 seconds release the Sleep/Wake button. Continue holding the home button until iTunes pops up a message telling you that it has detected an iPhone in recovery mode. Now you can do a restore on your iPhone. * Note: It may take a few attempts. Hold down both buttons then release the Home button just before I think the Apple logo would appear. If you are still holding both buttons down and you see the Apple logo you are holding them down for too long!